We are stoked to be hosting Daddy Kev from LA/AlphaPup/LowEnd, September 14. We will be selling presale tickets for $10.00 at In4mation Pearlridge, About the Goods, Truest, and online. There will be a transaction fee online, small kine. We will facebook, twitt, and IG when the presales are instore/online to cop. All love and beats. Time to head nod and vibe out, not lose you mind and get stupid. Don’t Sleep. The last time Daddy Kev came to Hawaii was with Myka 9, and that was a while back. On a much needed vacation he is gonna bless Hawaii with one show before he goes in to tropical mode. We also got Mr. Carmack, which for some reason never did a show in Hawaii, except for Beatroot, this should be crazy. Welwing from COTQ, with his adios performance b4 he jets to the North West. Vezzen, Sentric, Oliver, Observ, KTC, & Hypo. Its gonna be a packed night of sound. So don’t sleep. Online presale will be available this week and at certain stores. Mahalo for the support. Chee Hooz. Killa Kanaka wit one BRGC13 Flip. I like to apologize to, Killa Kanaka, for not posting this when BRGC13 was so active. Better late then never, check out his Beat flip. Don’t Sleep. Where from: Born and Raised on da aina. Website to check out your music: No need website fo hea. Just listen…. Shout outs: Shouts out to everybody dat make beats. Mine mo bettah cuz i HAAAWAIIAN!!! Didn’t wanna blow it up until after BRGC! Here it is Beatroots red head step child. No limitations only rules would be original beats & NO DEAD AIR. 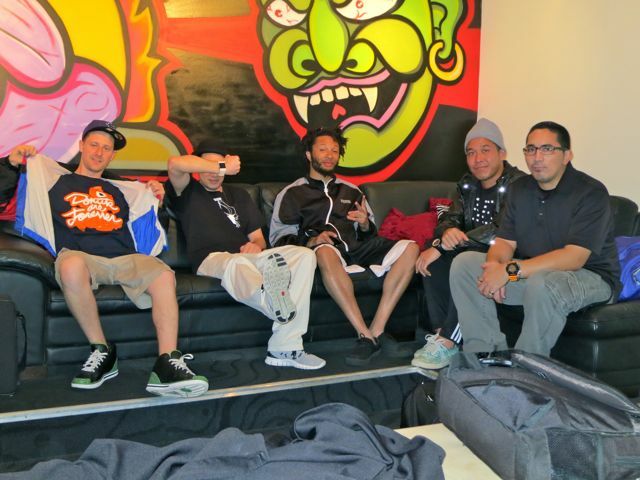 We got the Seattle Ohana headlining with the Metisunz getting on right b4. 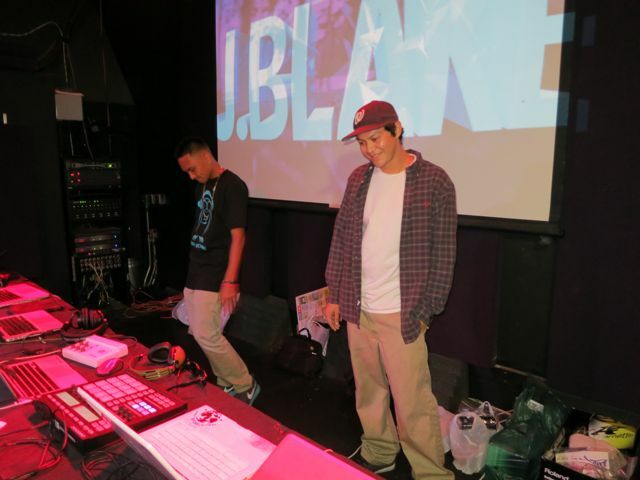 Also over 15 of Hawaii’s producers will be flexing 7 – 10minute sets throughout the night. 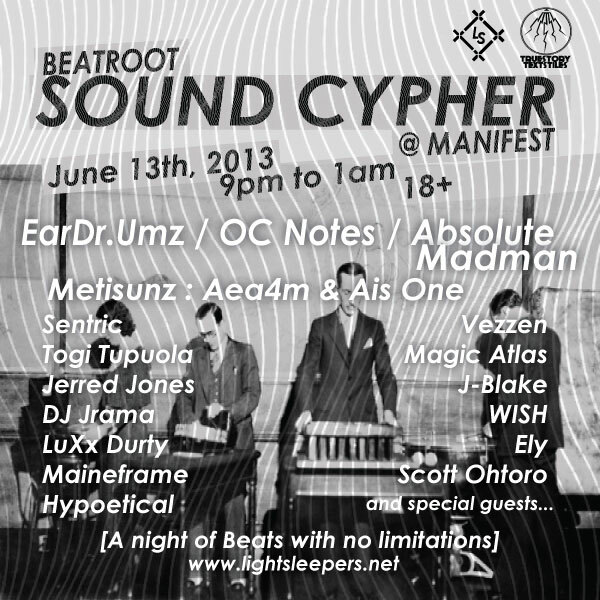 MANIFEST | Thursday – June 13 | 9pm – 1am | 18+ | Don’t Sleep. 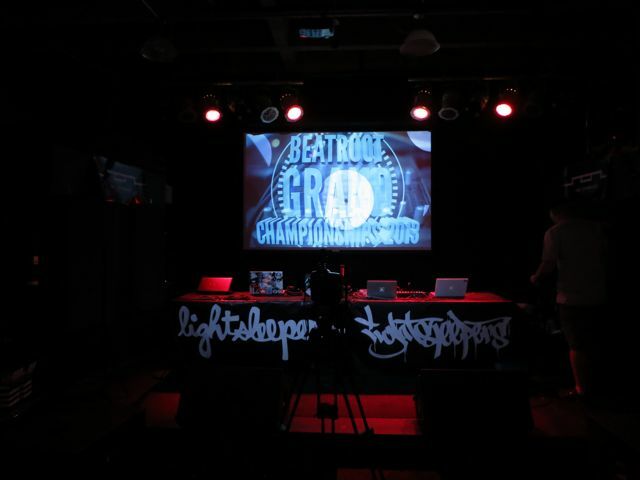 Beatroot Grand Championships 2013 is a wRap! With Mr. Carmack taking the crown and the dope award. From the beginning, it was a tight race for first. With TSRK, J-Blake, Magic Atlas, WISH, & Jim Hurdle trading beats back and forth like 2 prize fighters duking it out for 12 rounds. With no notice from Nextdoor, i had to change the venue because they were closed down. So i found the old Rred Elephant that is now, The Venue. The Seattle homies made the trip down; EarDr.Umz, Absolute Madman, OC Notes, Hideki, & Sentric. The LSD was in full effect. Hypoetical kills on the visuals. The Horror Show; DJ Jon Cozy & Decibel Grand. 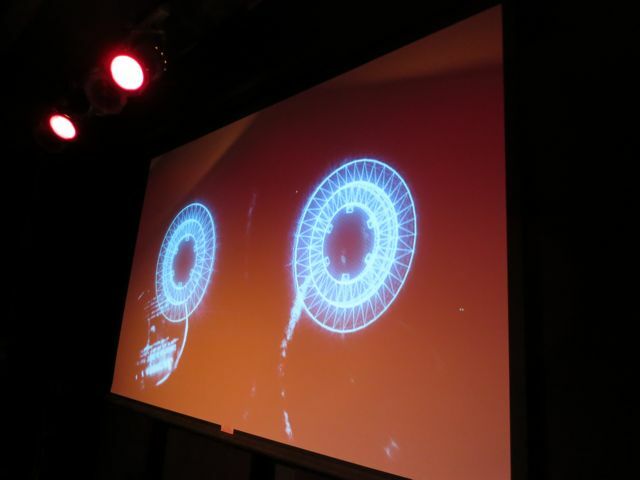 Eye view of Hypos visuals. Rey Helicopter with that rig. Mr. Carmack getting that work done and taking it home. He got that sound man! TSRK, that kid is looney, in a awesome way! It could of gone either way the beats were so hyped. Overall, it was a great night! All the producers brought it hard! The people showed love and came through. The Venue sound system pumped. 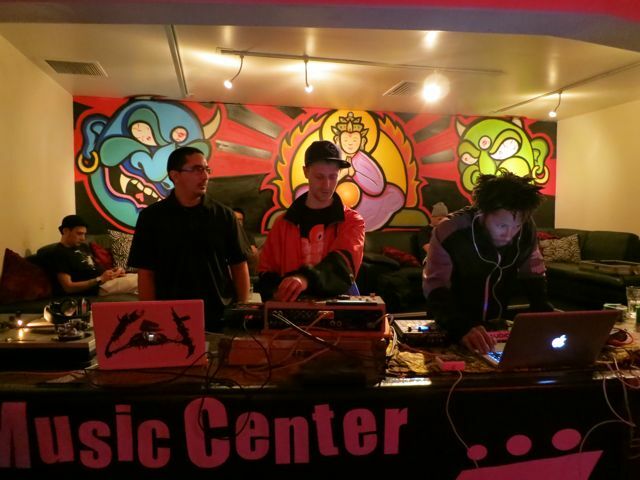 Thank you to our sponsors, Eazy Music Center for always having our back! 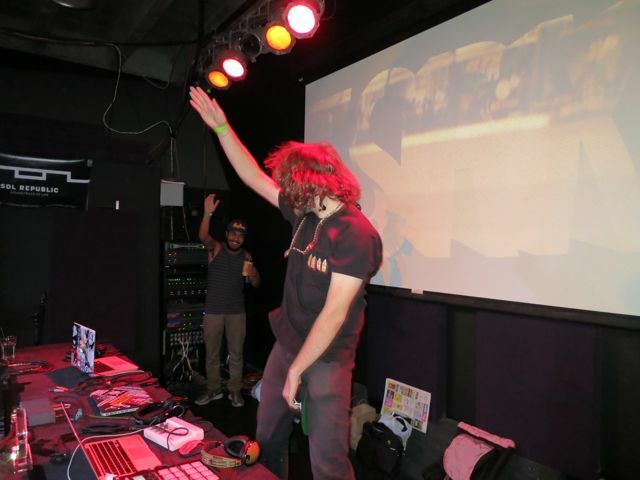 In4mation, Truest, About the Goods, Ableton, Incase, Mixcrate?, and LS. Now to plan the Grand Championships! Don’t Sleep. WISH, is a producer cut from the same cloth. Vinyl, Records, Wax. I love that ish. That is why im not a judge. And for the record, i don’t care who wins, never do. I do have an opinion but that takes no value and i trust that the judges choose the right winner. You gotta love the stories of these producers. From New Mexico to Kaneohe, how does that even happen? Its Hawaii Aloha. Its Hip-hop. Don’t Sleep….Mr. Carmack is up next. Beatroot Grand Championships | June 8th | at The Venue | 9pm – 1am. The dark horse just because he is the most unknown to the battle. TSRK, The Super Robot King, has the best name and he got that swagger. Notice i said, swagger, not swag. You gotta love anyone that exudes confidence in a battle. Big ups TSRK, can’t wait to hear you battle and props to Togi Tupuola. Don’t Sleep. 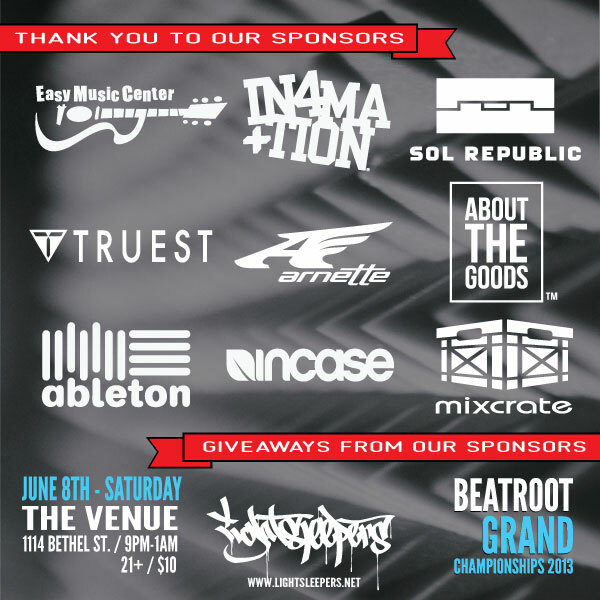 Beatroot Grand Championships | June 8th | at The Venue | 9pm – 1am. We value all of our sponsors. We specially like to thank, Easy Music Center. Back when the Rred Elephant closed down, Beatroot was homeless. EMC, offered to hold BR prelims. It has been awesome ever since. For every paid entree they will receive a raffle ticket with a chance to win anything from stickers, to shirts, a pair of new headphones, or a brand new pair of sunglasses. Feel free to buy 2, 3, 4 entrees, up your chance to win the good stuff. Overall, we hope that everyone that supports us goes home with something. Mahalo to all our sponsor and all the positive people planning on rolling through. Respect.